We’ve seen lots of heist movies. Enough to make movies depicting straight heists boring, therefore requiring some clever trickery to make one’s particular heist movie larger than life. In turn, we’ve seen that happen in the Ocean Eleven, Twelve and whatever series. 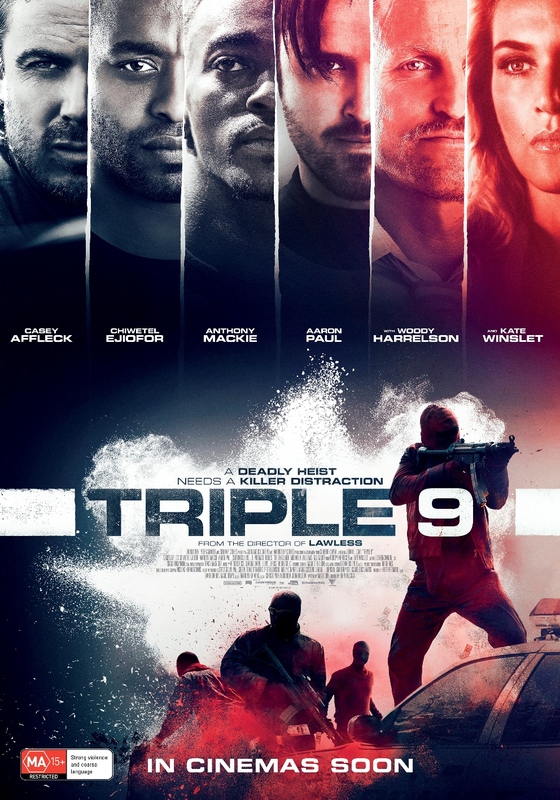 Enter Triple 9, another heist movie. Just like the Ocean series, it features lots of famous actors. My favourite? Kate Winslet as the head of a Jewish Russian mob in contemporary Atlanta, operating under the guise of a Kosher abattoir. Triple 9’s larger than life trick lies with the idea that the people pulling the heist can earn more time to pull off the greatest heist ever by occupying police attention elsewhere through the act of taking down a policeman. Apparently, in American police code lingo, that’s called a 999. Thus we have ourselves an entertaining movie where the main narrative lies in corrupt policemen pulling off a heist for the Jewish/Russian mafia for which they are required to kill a fellow policeman. Yes, it’s entertaining, but no, it’s nothing more than that. Not that there’s anything wrong with being entertained. Overall: Your classic action flick refreshment goes as far as 3 out of 5 crabs.